MADE and the RIBA will launch a new hub for built environment events and training in the New Year. After four years in Newhall Square MADE is moving to new offices at 321 Bradford Street. The premises already host a number of built environment businesses including Glenn Howells Architects, project management consultancy DBK, innovative engineer/architects Emission-Zero and Interior architects Wilkinson Beven. MADE will be sharing office space with the RIBA. On the ground floor of 321 Bradford Street a variety of meeting spaces have been created which both MADE and the RIBA will use for events and training. The intention is to create a hub for built environment meetings, exhibitions and CPD in the city. 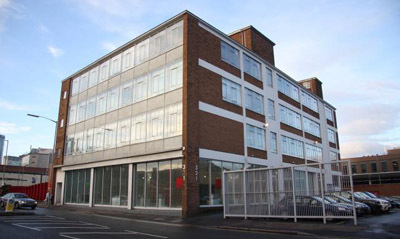 321 Bradford Street is located behind Digbeth Coach Station just a short walk from New Street and Moor Street Stations. The move will take place just before Christmas and MADE will start operating from its new home from the New Year. From the New Year the MADE events space at 7 Newhall Square will no longer be available to book. To find out about meeting space at 321 Bradford Street contact Rheya Mills by email or on 0121 666 7640.